Based on a simple concept: The body is like a massive bio-computer, and just like your home computer gets bad programming, viruses and eventually slows down and stops working correctly, so do we! The Emotion Code and The Body Code are incredible tools to tap into the body’s systems and tune-up, re-program, and balance the body – allowing it to function better and heal itself! People report feeling LESS pain, Anxiety and stress, and MORE Emotional Balance, Peace, and Calm. The Emotion Code is a technique for releasing trapped emotions in the body. Developed by Dr. Bradley Nelson, a Holistic Chiropractic Physician, Medical Intuitive and one of the world’s foremost experts in the emerging fields of Bioenergetic Medicine and Energy Psychology. Dr. Nelson’s work is based on the concept that emotionally-charged events from one’s past are stored in the body as trapped emotions. These energies take up space and distort the vibration where they are trapped, eventually leading to not only a disruption in the organs and tissue in that area, but globally in the whole body. 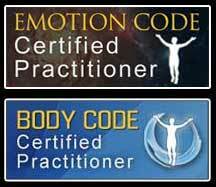 The Body Code, like The Emotion Code (above), was founded by Dr. Bradley Nelson. It is more expansive and far more detailed than The Emotion Code, focusing on locating and releasing more than just trapped emotional energy. The Body Code is a guide or a tool that makes finding imbalances (whether or not there are symptoms) simple. Balance is returned to the body and self correction takes place when imbalances are released; the more balanced you are the healthier you remain. People have often said after releasing trapped emotions that they just feel lighter. That they have never looked at their situation or event that way, and suddenly they’re ok with letting it go and moving on. When that happens, amazing new things can enter your life! Releasing trapped emotions using The Body Code or any other type of Energy Healing practiced by Holly Wall, whether in person or by proxy, is not a substitute for medical care. This information is not intended as medical advice and should not be used for medical diagnosis or treatment. Information given to you by Holly Wall is not intended to be a replacement for consultation with a healthcare professional. If you have questions or concerns about your health, please contact your healthcare provider. Energy Healing promotes harmony and balance within, relieving stress and supporting the body’s natural ability to heal. Energy healing is widely recognized as a valuable and effective complement to conventional medical care. Healing sessions are strictly confidential. Your personal information will never be shared with anyone. Holly Wall makes no claims as to healing or recovery from any illness. This information is offered as a service and is not meant to replace any medical treatment. No guarantee is made towards validity. Use this information at your own risk.